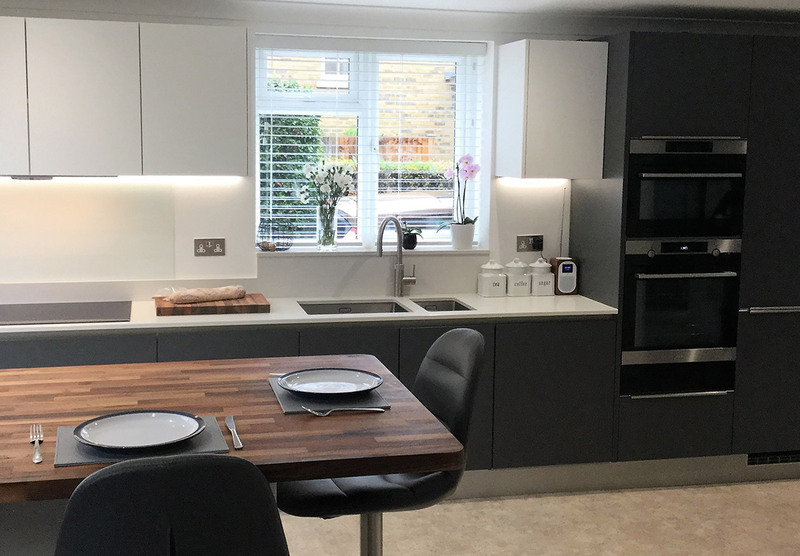 David and Jackie had seen Artizan Interior’s kitchens at a couple of their friends’ houses and visited our Chertsey showroom following recommendations from them. 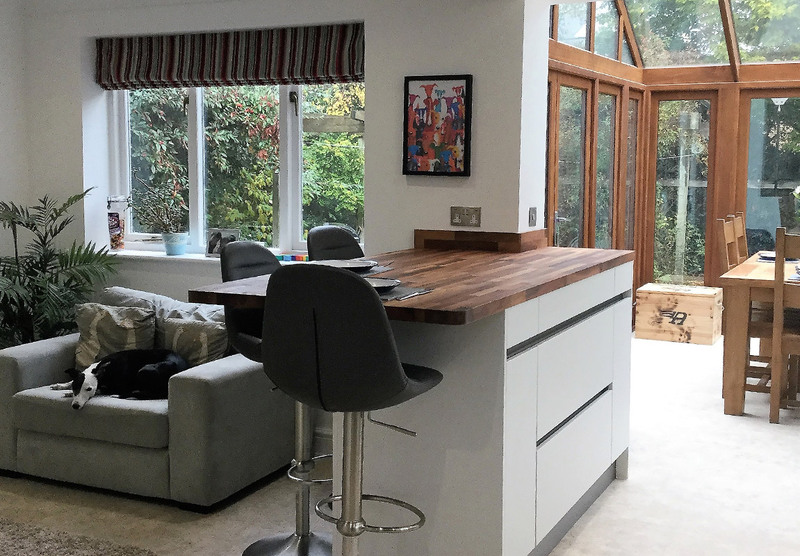 While functional, their existing kitchen was not in keeping with the style and spacious feel of their home – the units were tired and dated looking and there wasn’t enough light coming through from the existing windows. Some of the walls and doorways also had to be re-configured to achieve an open feel to the space. 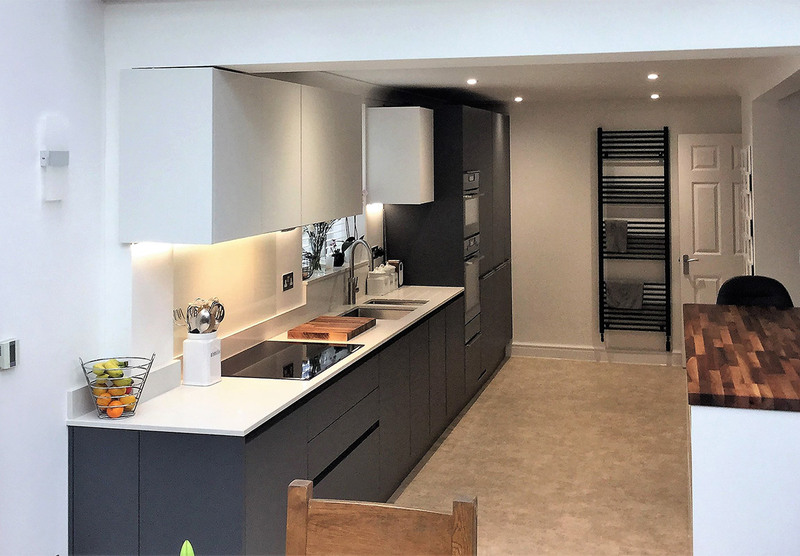 After an initial consultation with Alex, the outline of the brief was enough to understand the changes required to their existing kitchen space. ‘Light, family space, storage, modern, kids homework, access, warm, quality, family’ were some of the words used to describe what they wanted. 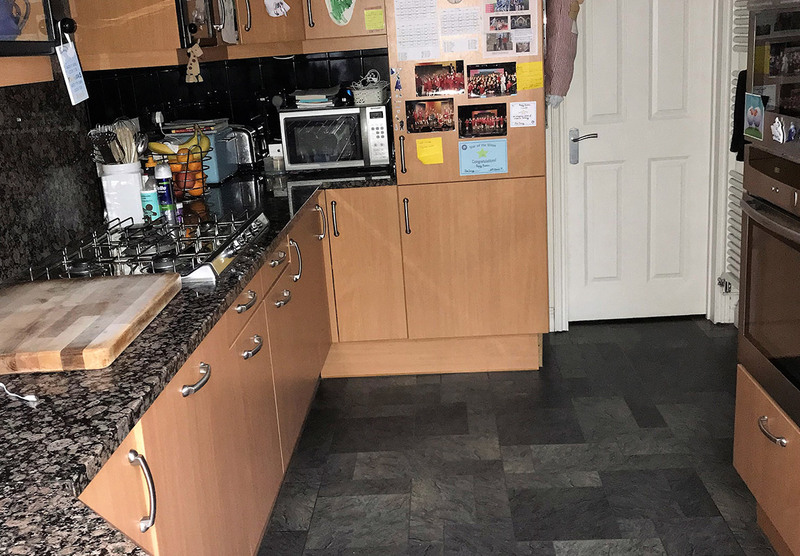 Jackie and David wanted a quality kitchen and opted for the best – theGerman manufacturer Stormer, in a handless system with Bergamo doors in Nero grey and white. The internal carcasses are white with the front edges matching the door colour. The tall units have integrated handles and a square edge style. 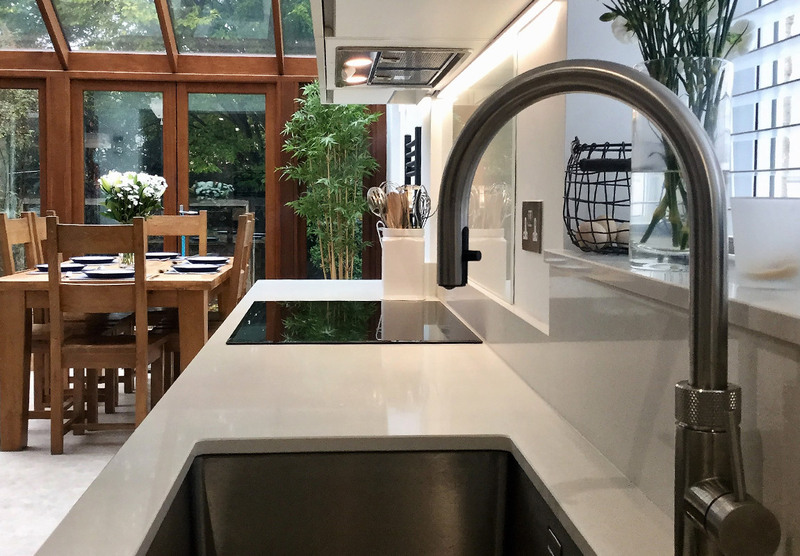 A quartz worktop and upstand with glass splashback replaced the dark and dated tiles, and we installed a Quooker hot water tap and Caple stainless steel sinks, above which an opening was created to fit a window and flood the area with light. Integrated extraction above the hob ensures functionality with no disruption to the sleek design. A very important part of the brief was a peninsula breakfast bar for more informal eating and to open up the space connecting the kitchen with the TV room. Jackie wanted a walnut countertop here as she’d had one previously and loved it, the contrast brings warmth to the very clean lines of the main part of the kitchen. There is plenty of storage in the new kitchen, with large pan drawers and secret cupboards where end panels would normally be and pull out larder drawers so everything has a place. “Working with Artizan Interiors has been an incredible experience from start to finish. From initial designs through to final adjustments, Alex has really given a personal touch to our kitchen project. We have been so impressed with his attention to detail, product knowledge and ongoing support as the design came to life. What could have been a stressful experience has been made so much more enjoyable by working with Artizan Interiors. We are thrilled with the end result and would not hesitate in recommending them”.